International attendees accounted for 17.6 percent of the overall attendance. 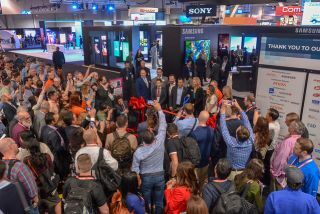 Digital Signage Expo (DSE) has revealed the total verified attendance at its 2019 event was 4,260. That represents a 6 percent gain vs. 2018 and is the second largest attendance in show history, according to show officials. International attendees, sourced from 63 countries accounted for 17.6 percent of the overall attendance. In addition, DSE delivered the highest number of qualified end users in its history: 1,848. This high-impact audience included many new as well as familiar end-user attendees including Canada Post, Bruster’s Real Ice Cream, Crate & Barrel, PepsiCo, Boston Children’s Hospital, Choice Hotels, Harkins Theaters, Incheon Airport, NASCAR, Famous Footwear, Yale University, Seattle Art Museum, University of Southern California, Banner Bank, Smashburger, 24-Hour Fitness and Garmin and more. Digital Signage Expo is scheduled for March 31-April 3, 2020, with access to the Exhibit Hall April 1-2 at the Las Vegas Convention Center. For more information, visit www.dse2020.com.